As a base, I started with one of my most tried-and-true, easy, fail-safe chocolate cake recipes. It’s from my mom’s vintage Betty Crocker cookbook from the 60s. 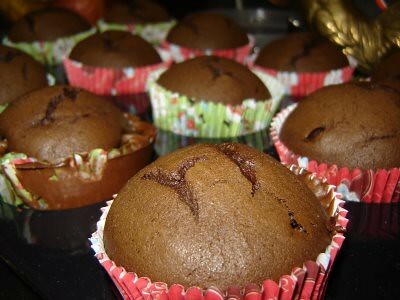 Heat oven to 350 degrees and prepare cupcake pan with liners or grease. Measure all ingredients into large mixer bowl. Blend 1/2 minute on low speed, scraping bowl constantly. Beat 3 minutes high speed, scraping bowl occasionally. 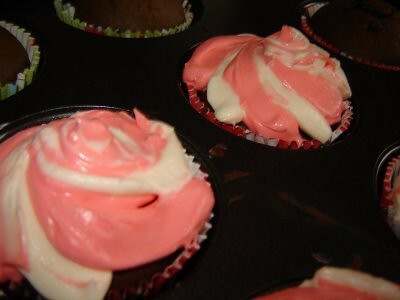 Pour batter into cupcake tins until 2/3 full. Bake for 20 minutes. Cool on racks. Then, I took my trusty cream cheese frosting recipe, and made it wintry with some peppermint extract. Blend butter and cream cheese in small mixing bowl. Gradually add confectioners’ sugar until desired consistency is reached. Add vanilla and peppermint, and mix well. I took half of the icing and put it in a ziplock bag. 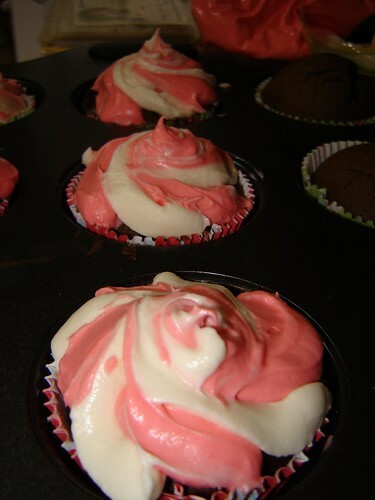 Then I added red food coloring (a few drops) to the remaining half of the icing, mixed well, and put it into a ziplock bag. Then, I cut the corner off of the bags to pipe the icing onto the cupcakes, placing alternating stripes in curved strokes. 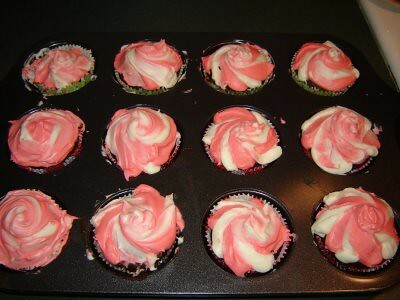 Then I finished them off by swirling the icing with a knife to create a peppermint-candy effect. They turned out beautiful, and soooo yummy! The moist and tender chocolate cake complimented the creamy zesty icing so well! !